The Resource Estimate was prepared pursuant to Canadian Securities Administrators' N I 43-101 by the independent firm SGS Canada Inc. ("SGS") of Blainville, Quebec. The updated Resource Estimate includes an indicated resource of 2.65Mt ("million tonnes") with an average grade of 0.80% graphite, and an inferred resource of 7.56Mt with an average grade of 0.77% graphite, within the boundaries of an optimized open pit mine model. The cut off grade for the Mineral resources was established at 0.50% graphite. The new pit constrained graphite resources have increased by 379% compared to what was reported in the Company's Miller Project Preliminary Economic Assessment, filed to SEDAR on April 14th, 2016. A cross section figure of the pit is available on Canada Carbon's website (https://www.canadacarbon.com/images/CCBCrossSection.jpg). Mineral Resources were estimated from the diamond drill holes and channels analytical results completed by Canada Carbon since 2013. A total of 151 drill holes and 96 surface/channels, comprising 8,148 assays were used for the mineral resources model. 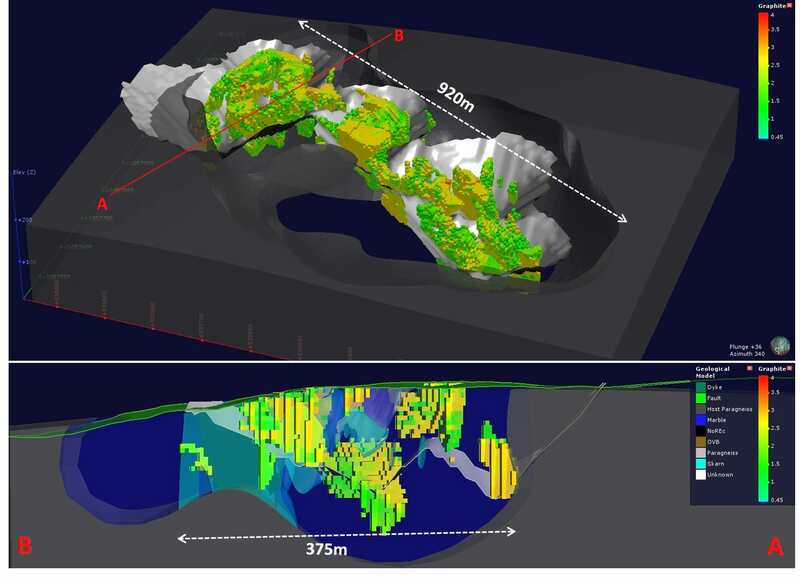 The 3-D modeling of graphite Mineral Resources was conducted using a minimum cut-off grade of 0.50% Cg over a 2 m horizontal thickness within a preliminary lithological model. The initial mineralized solids were developed using Leapfrog©, and subsequently remodelled within SGS's proprietary modeling software Genesis©. Assay data were composited to 1.5m. The interpolation was conducted using Ordinary Kriging of the low grade graphite mineralization and Indicator Kriging for the high grade graphite veins. The block model was defined by a block size of 5 m long by 5 m wide by 5 m thick and covers a strike length of approximately 1,030 m to a maximal depth of 170 m below surface. The modeled graphite mineralization is open both at depth and strike. The Mineral Resources were constrained within the boundaries of an optimized pit shell using the parameters stated in Table 2 below. All parameters were derived and updated from the economic assessment process associated with the Company's Miller Project PEA. Any interpolated blocks of the resource model located outside of the optimized pit shell are not included in the Mineral Resources. All dollar values in Table 1 are expressed in Canadian dollars, with the exception of the revenue value for the thermally treated graphite, assumed to be US$ 13,000/tonne. At an assumed currency exchange rate of 0.75, the revenue/tonne is approximately CDN$ 17,300. Treatment and Refining 1,560.34 $/t conc. Cautionary Note: Mineral Resources that are not Mineral Reserves do not have demonstrated economic viability. There is no guarantee that all or any part of the Mineral Resource will be converted into a Mineral Reserve. Inferred Resources are considered too geologically speculative to have mining and economic considerations applied to them and to be categorized as Mineral Reserves (as defined in NI 43-101). Additional trenching and/or drilling will be required to convert Inferred Mineral Resources to Measured or Indicated Mineral Resources. Mineral Resources that are not Mineral Reserves do not have demonstrated economic viability. The 100%-owned Miller Graphite and Marble Project is located in the Outaouais Region of southern Québec, Canada, about 80 km west of Montréal, Québec and 90 km east of Ottawa, Ontario. The closest cities are Grenville, Québec (5 km to the south) and Hawkesbury, Ontario (8 km to the south). The property is easily accessible from Highway 50, which runs approximately 2 km to the south of the Project boundary, and Scotch Road, which traverses the property from south to north. A wide range of services are available locally in the town of Grenville and at the nearby cities of Hawkesbury or Lachute. Project-specific services such as tree cutting, excavating, drilling, and blasting are available from local operators. Other required services including emergency response, equipment maintenance shops, transport companies, mobile electricians, mobile mechanics, security firms, IT firms, engineering, environmental and geological consultants, restaurants and a variety of housing options are all available near the property. The local skilled labour force is capable of supporting a mining operation. A power line crosses the southern part of the property and a railroad runs parallel to Highway 50, near Grenville. The Project is 90 km via paved highway from the container port at Montreal. Mr. Jean-Philippe Paiment, P.Geo., M.Sc., from SGS Canada Inc., an independent Qualified Person as defined by National Instrument 43-101 guidelines, and has reviewed and approved the technical related content of this news release.